^ 1.0 1.1 1.2 Film releases. Variety Insight. [2018-02-10]. （原始内容存档于2018-05-12）. ^ Weintraub, Steve. 'Venom' Movie Rating and Runtime Revealed. Collider. 2018-09-13 [2018-09-13]. （原始内容存档于2018-09-14）. 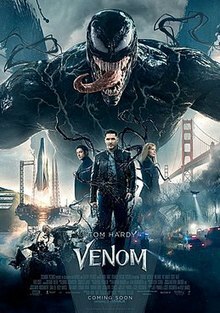 ^ 4.0 4.1 Venom (2018). Box Office Mojo. [2018-09-25]. （原始内容存档于2018-09-16）. ^ D'Alessandro, Anthony. ‘Venom’ Bound To Be In The Black With Marvelous $80M October Opening; ‘A Star Is Born’ Hits $43M+ High Note. Deadline Hollywood. Penske Business Media. 2018-10-06 [2018-10-06]. （原始内容存档于2018-10-05）. ^ 《毒液》（暂译）曝光最新片场照. 蜘蛛侠系列电影. 2017-11-06 –通过新浪微博. ^ Kroll, Justin. Tom Hardy to Star in ‘Venom,’ Ruben Fleischer to Direct. Variety. 2017-05-19 [2017-05-21]. （原始内容存档于2017-05-20）. ^ 8.0 8.1 Lang, Brent. Spider-Man Cinematic Universe: How Sony Plans to Build on the Success of ‘Homecoming’. Variety. 2017-07-19 [2017-07-26]. （原始内容存档于2017-07-26）. ^ Butler, Tom. Tom Hardy's Venom is a performance capture role, reveals Andy Serkis (exclusive). Yahoo! UK. 2017-10-24 [2017-10-24]. （原始内容存档于2017-10-24）. ^ 10.0 10.1 Lang, Brent; Kroll, Justin. Replacing Kevin Spacey on ‘All the Money in the World’ Will Cost Millions. Variety. 2017-11-10 [2017-11-12]. （原始内容存档于2017-11-11）. ^ 11.0 11.1 Dumaraog, Ana. Michelle Williams Is Definitely Playing Anne Weying in Venom. Screen Rant. 2017-12-18 [2017-12-18]. （原始内容存档于2017-12-18）. ^ D'Alessandro, Anthony. Tom Hardy Presents New ‘Venom’ Trailer At CinemaCon – Watch. Deadline Hollywood. 2018-04-23 [2018-04-28]. （原始内容存档于2018-04-27）. ^ 13.0 13.1 N'Duka, Amanda. Sope Aluko Cast In ‘Venom’; Andreja Pejić Joins ‘The Girl In The Spider’s Web’; James Trevena-Brown In ‘Charlie Says’. Deadline Hollywood. 2018-03-14 [2018-03-15]. （原始内容存档于2018-03-15）. ^ 14.0 14.1 14.2 Romano, Nick. Venom teaser reveals Tom Hardy as Spider-Man anti-hero. Entertainment Weekly. 2018-02-08 [2018-02-08]. （原始内容存档于2018-02-08）. ^ 15.0 15.1 Galuppo, Mia. New 'Venom' Trailer Unveils Tom Hardy's Anti-Hero Transformation. The Hollywood Reporter. 2018-04-23 [2018-04-28]. （原始内容存档于2018-04-27）. ^ Melora Walters: Working with Tom Hardy Was "A Dream Come True" - 'Venom' Premiere. The Hollywood Reporter. 2018-10-01 [2018-10-06]. （原始内容存档于2018-10-07）. ^ 17.0 17.1 17.2 17.3 17.4 Duncan, Amy. Venom release date UK, trailer, age rating and cast joining Tom Hardy. Metro. 2018-08-01 [2018-08-01]. （原始内容存档于2018-08-01）. ^ N'Duka, Amanda. Legendary/Universal’s ‘Detective Pikachu’ Adds Omar Chaparro; Jeremy Sumpter, Tom Berenger Cast In ‘Sargasso'. Deadline Hollywood. 2018-04-17 [2018-04-17]. （原始内容存档于2018-04-17）. ^ Galuppo, Mia. 'This Is Us' Star Ron Cephas Jones Set for 'Venom'. The Hollywood Reporter. 2018-08-21 [2018-08-21]. （原始内容存档于2018-08-22）. ^ Chitwood, Adam. Did You Miss These ‘Spider-Man’ Easter Eggs in ‘Venom’?. Collider. 2018-10-08 [2018-10-08]. （原始内容存档于2018-10-08）. ^ Simpson, George. Venom Stan Lee cameo: Here’s when the Marvel creator appears opposite Tom Hardy. Express.co.uk. 2018-10-03 [2018-10-03]. ^ Kroll, Justin. Riz Ahmed in Talks to Join Tom Hardy in Spider-Man Spinoff ‘Venom’. Variety. 2017-08-09 [2017-08-10]. （原始内容存档于2017-08-10）. ^ Kroll, Justin [@@krolljvar]. Sources say Matt Smith, Pedro Pascal and Mathias Schoenarts also up for the part (推文). 2017-08-10 [2017-08-11]. （原始内容存档于2017-08-11） –通过Twitter. ^ Kroll, Justin. Michelle Williams to Star in ‘Venom’ Opposite Tom Hardy. Variety. 2017-09-27 [2017-09-27]. （原始内容存档于2017-09-27）. ^ 25.0 25.1 Kroll, Justin. Jenny Slate Joins Tom Hardy in ‘Venom’ (EXCLUSIVE). Variety. 2017-10-03 [2017-10-04]. （原始内容存档于2017-10-03）. ^ Kroll, Justin. ‘Veep’ Actor Reid Scott in Talks to Join Tom Hardy’s ‘Venom’ (EXCLUSIVE). Variety. 2017-10-16 [2017-10-16]. （原始内容存档于2017-10-16）. ^ Kit, Borys; Couch, Aaron. Scott Haze in Talks to Join Tom Hardy in 'Venom' (Exclusive). The Hollywood Reporter. 2017-10-19 [2017-10-22]. （原始内容存档于2017-10-21）. ^ Kroll, Justin [@@krolljvar]. VENOM update: Kelly Marcel ( 50 SHADES OF GREY) penning latest draft of script (推文). 2017-10-03 [2017-10-04]. （原始内容存档于2017-10-04） –通过Twitter. ^ Weintraub, Steve. 'Venom' Movie Rating and Runtime Revealed. Collider. 2018-09-13 [2018-09-13]. （原始内容存档于2018-09-17）. ^ Venom Movie [@@VenomMovie]. Day 1. #Venom (推文). 2017-10-23 [2017-10-24]. （原始内容存档于2017-10-24） –通过Twitter. ^ Marc, Christopher. UPDATE: ‘Venom’ Production Start Delayed Until Late October. Omega Underground. 2017-09-09 [2017-09-10]. （原始内容存档于2017-09-10）. ^ Dumaraog, Ana. Venom Movie Working Title May Hint At New Origin. Screen Rant. 2017-07-15 [2017-07-15]. （原始内容存档于2017-07-15）. ^ Oliver Scholl (PDF). Gersh Production. [2017-09-03]. （原始内容存档 (PDF)于2017-09-03）. ^ 34.0 34.1 Chitwood, Adam. The ‘Venom’ Movie Will Be Primarily Based on These Two Comic Runs. Collider. 2017-12-09 [2017-12-10]. （原始内容存档于2017-12-10）. ^ Kroll, Justin. Woody Harrelson in Talks to Join Tom Hardy in ‘Venom’. Variety. 2017-12-12 [2017-12-13]. （原始内容存档于2017-12-13）. ^ Pereira, Alyssa. Marvel movie 'Venom' starring Tom Hardy and Michelle Williams to film in San Francisco. San Francisco Chronicle. 2018-01-11 [2018-01-27]. （原始内容存档于2018-01-27）. ^ Pereira, Alyssa. Locals spot 'Venom' stars Tom Hardy and Michelle Williams around San Franciscoo. San Francisco Chronicle. 2018-01-26 [2018-01-27]. （原始内容存档于2018-01-27）. ^ Medina, Joseph Jammer. Tom Hardy Wraps On Venom Movie. Latino Review Media. 2018-01-29 [2018-01-29]. （原始内容存档于2018-01-29）. ^ N'Duka, Amanda. ‘Black Panther’ Composer Ludwig Goransson Tapped To Score Sony’s ‘Venom’. Deadline Hollywood. 2018-03-29 [2018-03-30]. （原始内容存档于2018-03-30）. ^ Yoo, Noah. Eminem Teases Venom Soundtrack Song: Listen. Pitchfork. 2018-08-30 [2018-08-31]. （原始内容存档于2018-08-30）. ^ 'Venom': First Reactions from the Premiere. The Hollywood Reporter. 2018-10-01 [2018-10-02]. （原始内容存档于2018-10-02）. ^ Busch, Anita. Tom Hardy Is ‘Venom’ In New Sony Marvel Film To Be Directed By Ruben Fleischer. Deadline.com. 2017-05-19 [2017-05-21]. （原始内容存档于2017-05-20）. ^ Venom (2018). Rotten Tomatoes. [2018-12-23]. （原始内容存档于2018-12-23）. ^ Venom (2018). Metacritic. [2018-10-07]. （原始内容存档于2018-10-06）. ^ Rocket Girls 火箭少女101 - 毒液前來 / Official MV Ver.電影《毒液》推廣曲. YouTube. 2018-10-28 [2018-12-23]. ^ 許世穎. 《猛毒》首日飆2300萬霸全台！致敬彩蛋創話題. 自由時報. 2018-10-05 [2018-10-20]. ^ 48.0 48.1 全國電影票房2018年10/08-10/14統計資訊 (PDF). 國家電影中心. 2018-10-18. ^ 全國電影票房2018年10/15-10/21統計資訊 (PDF). 國家電影中心. 2018-10-25. ^ 全國電影票房2018年10/22-10/28統計資訊 (PDF). 國家電影中心. 2018-11-01. ^ 娱乐独角兽. 首日票房2.39亿，“救市主”《毒液》能推动“索尼漫威宇宙”吗？. 新浪微博. 2018-11-15 [2018-11-11]. ^ Kit, Boris. 'Spider-Man' Spinoff 'Venom' Revived at Sony (Exclusive). The Hollywood Reporter. 2016-03-04 [2017-05-21]. （原始内容存档于2017-05-20）. ^ Weintraub, Steve. Director Ruben Fleischer on 'Venom', Carnage, and Tom Hardy's Insane Performance. Collider. 2018-10-12 [2018-10-17]. （原始内容存档于2018-10-17）. ^ Outlaw, Kofi. Tom Hardy Is Already Signed for 'Venom' Movie Trilogy. ComicBook.com. 2018-08-24 [2018-08-31]. （原始内容存档于2018-08-30）. ^ Clark, Travis. Venom' gives Sony an edge over Disney in its fight to keep 'Spider-Man,' according to industry experts. Business Insider. 2018-11-06 [2018-11-07]. （原始内容存档于2018-11-07）. ^ Kroll, Justin. ‘Venom’ Sequel in Works With Kelly Marcel Returning to Pen Script (EXCLUSIVE). Variety. 2019-01-07 [2019-01-08]. （原始内容存档于2019-01-08）. ^ Donnelly, Matt. Sony Dates Two Marvel Movies for 2020. Variety. 2018-11-21 [2018-11-22]. （原始内容存档于2018-11-22）.